1. What is your favorite faith-based hymn, song or chorus? “Be Thou My Vision” just stirs my Presbyterian heart… “heart of my own heart, whatever befall…” The non-conformist in me is rebelling, and even though this is no doubt a “Presbyterian Anthem” that will be named by many other memes as favorite, I have to tell the truth. It was sung in my wedding and ordination. 2. What was the context, content and/or topic of the last sermon that truly touched, convicted, inspired, challenged, comforted and/or otherwise moved you? I was inspired and moved during worship at a recent meeting of the Presbyery of the Western Reserve when Jon Fancher (pastor of Rocky River Presbyterian Church) preached using the story, “A Strange Providence,” from “Good News from North Haven” by Michael Lindvall. It was perfectly appropriate on the day we were voting to dismiss one of our congregations to the Evangelical Presbyterian Church. 3. If you could have all Presbyterians read just one of your previous posts, what would it be and why? Words, words, words. So much of this presidential political campaign is words, words, words. At some point it begins to sound like Charlie Brown’s school teacher. Wah wah, wah wah, wah wah. So I wonder, what about the words we utter in our proclamation of The Word each time we climb into the pulpit? Do we become cartoon teachers as well? Or is there something different about our words? It frightens me a bit to think about the church in terms of words, particularly the words of its preachers. So I wonder a bit more. Do our words matter only insomuch as they lead us to practice our faith? Words with a purpose? Is that, perhaps, the way God’s Spirit inspires the Word in us each time we hear the words? As the presidential candidate speaks, I wonder how important the words are unless some of the hopes, dreams, and promises find feet and become enacted in the corporate life of our nation. The practice of being citizens together? Interested in reading other Presbyterian bloggers? Check out the Presbyterian Blog Ring! With the space limitation of 1500 characters (that is LETTERS, not words!) we are supposed to be able to clearly articulate the “key theological issues of our church and society that are reflected in the ministry of your congregation.” It’s impossible, yet we have to try in order to get our CIF (Church Information Form) posted to Church Leadership Connection (which I think should be called “church harmony dot com” since it’s the PCUSA’s online match-maker service). So we’ve tried to come up with something terse yet significant, proufound yet not so much so that it frightens away prospective candidates for our Director of Christian Education and Youth Ministries position. I’ll post our attempt here. It reflects some musings that make sense to our congregation in suburban NE Ohio. I wonder what YOU might identify as the key theological issues in your context of ministry. Ok, and to be fair, think of this in terms of 1500 characters written for a CIF — that’s part of the context! What are the key theological issues of our church and society that are reflected in the ministry of your congregation/organization? What does it mean to be a follower of Christ in our cultural context? Our Christian faith makes deliberate and specific claims on our lives. At the same time, the world in which we live competes for our allegiance and asserts its own claim on us. Living as faithful disciples of Jesus in the midst of these sometimes opposing influences can be difficult. Pioneer seeks to be a church in which we are aware of the multiplicity of forces calling to us, and provide a community in which living as faithful disciples is nurtured. What does it mean to be Presbyterian in our denominational context? In 1951 Pioneer Memorial Presbyterian Church was formed out of two non-Presbyterian congregations that united and chose to become Presbyterian. Since that time Pioneer has been active in participation and leadership in the PC(USA). With the current divisions in the denomination, Pioneer is firmly grounded in the PC(USA) and the Reformed tradition. Pioneer has learned well how to be a congregation that values differences of opinion while remaining in covenant fellowship with each other, and we value our connections with our sister congregations in the PC(USA). What does it mean to be the Church in our world? The Church has a unique witness in and to the world. Peace, justice, healing, reconciliation, and compassion are words taken from the lexicon of Christian faith and which, when enacted, become the foundation for the Church’s place in the world. The life and ministry of Jesus demonstrated for us how to care for those most in need. The call of Christ moves us into the world to be the incarnation of God’s love to neighbors near and far. From hands-on local mission projects to working for peace and justice in the world, Pioneer seeks to be a congregation making a difference in the world. It’s a long story, but I’ve got 22 gallons of California grape juice (Cabernet Sauvignon, Pinot Noir, and a Chianti-like blend) turning into wine in my basement as I type this. If you’re interested, check out the details on my wine blog (www.wineministry.com). I’ve never made wine before, so this is an adventure — one that has “lots of blog posts” written all over it! I have been praying off and on most of today, feeling the weight of the conflicts in our Presbyterian denomination. But my prayers are not just despair, there is much hope in my thoughts and utterances. I am confident that in all of this God is much larger than any of us, and that Christ’s Church will survive even our most difficult disputes. There is further reason for hope. Our Presbytery, under the leadership of our Moderator and our Executive Presbyter, has set out to build bridges with the leadership and congregation of the Bay Presbyterian Church. Part of the bridge building is providing a response to the inaccuracies of the church’s documents (see today’s earlier post). But the biggest part of this effort is to have conversation and time together — leaders of the Presbytery with leaders of Bay. In my mood this morning I failed to hold up this wonderful effort. Regardless of the outcome, both Bay and the Presbytery have committed to work with one another in the process of Bay’s discernment. So my prayers continue. I pray that Christ would be at the center of it all — the center of Bay Presbyterian Church as they discern their future, the center of the Presbytery as we care for and work with one of our sister congregations, the center of us all that we would be faithful, compassionate, and Christ-like in all we do. I pray for the leaders of Bay Church, and for the leaders of our Presbytery. They are fine people — all of them. And I confess my own impatience, my own frustration, my own complicity. I still feel strongly that our relationships as congregations and Presbytery simply must be relationships of love, trust, integrity, and authenticity. We must be Christ-centered and Christ-like as best we can, even in the most difficult of circumstances. I’m in a foul mood. I’m disheartened and I’m angry. My spouse even brought me coffee this morning, but that didn’t salve my troubled soul. Presbytery meetings. As a pastor, I am not a member of a local congregation but of the “Presbytery” — the regional grouping of Presbyterian churches and the “governing body” for the churches within its membership. To be honest, most of these bi-monthly meetings are pretty-much snoozers. Mostly administrative. Mostly reports of the various ministries and missions of the Presbytery. And the coffee is always bad. We did get to meet Rev. Vilma Yanez-Ogaza, moderator of the Presbyterian Church in Colombia (South America). That was cool. And the best line of the evening: (in Spanish) “I’m from Colombia — we grow the best coffee in the world!” I’m sipping a nice Colombian blend right now. Cheers to you, Vilma! The best part of these meetings is always the connections — seeing people who serve and are members of other congregations in the area. We don’t get together enough to kindle the friendships and professional relationships between pastors and churches. But at least we can count on seeing each other every-other month at these 4-6 hour gatherings. And I usually leave tired from the tedium, but energized by the fellowship. But not last night. I was frustrated and disheartened. There is a church in our Presbytery, Bay Presbyterian Church, that is in the final stages of their plans to leave our denomination, the PC(USA). Yada yada. One more church that has become disillusioned by the theology and polity of our denomination. It’s boring news these days, and makes us Christians seeem even more irrelevant to the world around us. I can’t blame people for not wanting to become part of an “institutional church” if all they know about us is that we can’t get along. Bay Presbyterian is one more church in a string of congregations in our denomination that is packing up their marbles and leaving. It might be the first congregation in this Presbytery (Presbytery of the Western Reserve) to leave, but they are just one of a few dozen churches across the country who can’t stand how “liberal” the Presbtyerian Church has become. So they want to figure out where to go — to the EPC (Evangelical Presbyterian Church), the PCA (Presbyterian Church in America), or a new collaboration of like-minded conservatives within the PC(USA) who have arranged with the EPC to allow them in AND to allow them to keep ordaining women — the New Wineskins Association of Churches. If Bay Presbyterian Church decides to leave the denomination it will be a sad thing, one more demonstration that we truly have yet to figure out how to live in the wide embrace of God’s grace. 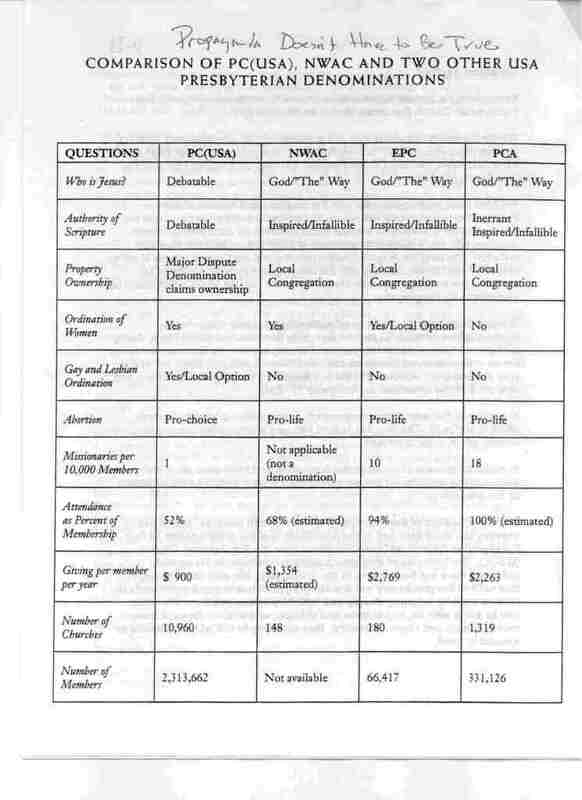 According to this document, the NWAC (New Wineskins), EPC, and PCA denominations answer the question: “God/”The” Way” (which, actually, is heresy… but that is another matter). The PC(USA) answer to the question? “Debatable” is what the document posits. If by “debatable” the leaders of Bay Church intend to be educating their congregation in the long history of the Reformed Tradition to be “Reformed and always being reformed,” then I commend them. We DO have healthy debates about Jesus, Scripture, issues facing the church, etc. If we didn’t engage in these conversations, we would not have ELEVEN confessions of faith. Each of these magnificent expressions grew out of confidence that who God is and what God is about is bigger that we can imagine or capture in words. Each of the confessions are the result of faithful discernment. So in this sense, “debatable” is a cornerstone value of the PC(USA). But that’s not what they mean. They are falsely accusing the PC(USA) of not having a Christology or an understanding of Scripture’s authority. Hogwash. And shame on those leaders for lying to their congregation and distorting the truth about the PC(USA). To the leaders of Bay Presbyterian Church: shame on you. You are engaging in behavior that violates your ordination vows. You are being like the divorcing spouse who makes up lies and false accusations to demonize your partner. Please don’t treat the “kids” and our “neighbors” this way, even if we are divorcing. I wish you would not leave the PC(USA). But if you do, I wish you all of God’s grace and peace. But I also wish that you would not distort who I am and who WE are in the Presbyterian Church (USA) simply to make the divorce feel better for you. We are sisters and brothers in Christ. That’s not debatable.